PRAIRIE SLOG Williams (far right) plays a pioneer on a grueling trek in Reichardt’s unusual take on the western. Anyone who’s been yearning to ditch the 21st century and play pioneer will have second thoughts after seeing the new independent drama from writer-director Kelly Reichardt. Meek’s Cutoff is a thought-provoking film, and sometimes a beautiful one, with a maddening pace and an oddly distant approach to its subjects. But no one can deny it’s an unusual take on the period drama. 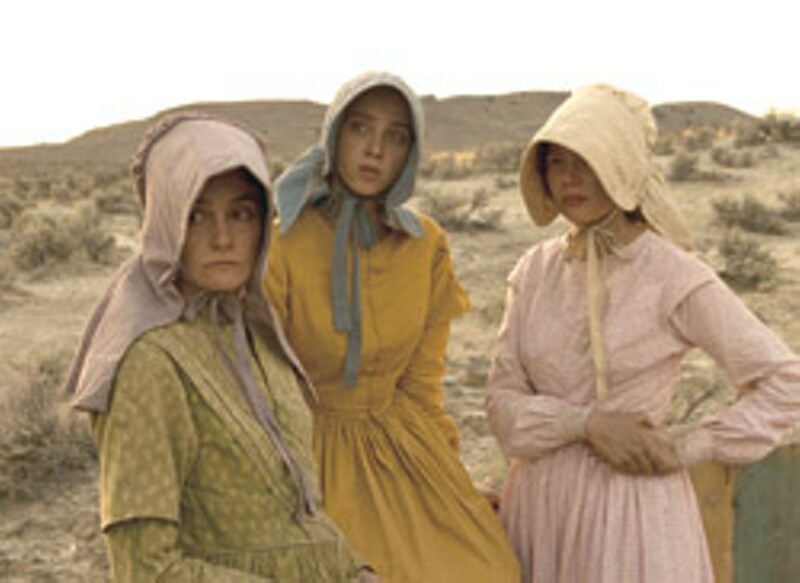 Known for her contemporary character studies (Old Joy, Wendy and Lucy), Reichardt takes us back to 1845 this time. Three pioneer couples traveling a high-desert section of the Oregon Trail have veered off under the guidance of grizzled mountain man Stephen Meek (Bruce Greenwood), who claims to know a shortcut. The film opens in medias res, with Meek’s charges already thirsty, tired, testy and doubting the wisdom of having followed a man who appears to be better at telling tall tales than at finding his way. In an early scene, the menfolk of the wagon train (Will Patton, Paul Dano and Neal Huff) gather to discuss the possibility of violently dispatching Meek before he leads them farther astray. Patton reports this to his canny young wife, Emily (Michelle Williams). They’re both so matter of fact as they contemplate murder — and their suspicion that Meek was paid by the British to keep Americans out of the contested Oregon territory — that it’s like watching a strategy session on a very low-key survival reality show. But the stakes are real. When we zip across America on freeways, it’s difficult to remember that this terrain once seemed as forbidding as the surface of Mars. Reichardt drives this point home when the settlers encounter a lone Native American (Rod Rondeaux), whom Meek pegs as a member of a particularly bloodthirsty tribe. Emily wants to spare his life in hopes he’ll help the party find water. Both are just guessing, since neither understands the Indian’s speech, and Reichardt doesn’t provide subtitles. When the settlers encounter drawings on the looming desert rocks, clearly made by the Indian’s compatriots, the symbols are just as cryptic: Are they signposts to water? Warnings of danger? Prayers to unknown gods? A science-fiction film about first contact with alien life couldn’t be creepier. Reichardt seems to want viewers to focus not on the film’s obvious conflict (how will the settlers survive this ordeal?) but on the question brewing under the surface: What does it take to shift the balance of power from an obviously incompetent leader? From the beginning of the film, the pioneer division of labor is unquestioned: The women cook and sew and make fires (and do a lot more intricate, tedious manual labor, while we watch); the men mend axles and chart the course. Emily isn’t one of those anachronistic feminist film heroines who simply speaks up and takes over; she operates covertly, but her mission is clear. Meek must be deposed. Perhaps that’s why some critics claim to see an Iraq war allegory in the film. Given how much attention Reichardt gives to historically accurate details, such an interpretation seems overreaching. The problem is that, those details of daily labor aside, the director doesn’t give us much solid information about her characters — the sort of background that would make us care about their plight or help us form stronger views of their actions. We never learn much about the relationships between the couples, their reasons for coming west or even where they started. It’s as if Reichardt feared that, by giving her actors too much expository dialogue, she’d pull us out of the period. The result is a film full of desert silences that are hypnotic — and frustrating. While Meek’s Cutoff is certainly an antidote to ever more hypercharged summer blockbusters, it may be remembered, like the historical Meek, more for what it promised than what it delivered. * Running time: 104 min.